Judy was one of the speakers at a Dipterists Forum meeting held at the University of Oxford's Museum of Natural History, South Parks Road, Oxford. Notes on her talk 'Soldierflies and Horseflies of the Oxfordshire fens', are now available - click here. There are also some photos. Judy attended this event at the invitation of Dr Tristan Pett, conservation scientist and manager of the Earthwatch Institute, who had heard her speak at the BBOWT Wild Oxford event on 26 September 2018 (see item below). At the reception at the Sheldonian Theatre, Earthwatch launched a new community project, Naturehood, with Simon King, which has received lottery funding and is initially being launched in Oxford and Swindon. Information was also given on developments planned under their 5-year strategy. "In Oxford we are specifically focusing on two areas: Cowley, in the communities surrounding Florence Park and in Marston. We know that you have been fundamental to the work in Milham Ford in particular as a founding member, and this area will be important, being in the middle of our Marston focus area'. Judy was one of the contributors to a BBOWT (Berkshire, Buckinghamshire and Oxfordshire Wildlife Trust) event held at the University of Oxford Museum of Natural History to show the progress made with the Wild Oxford Project over the last 5 years. Judy's ecological overview included an update of achievements at Chilswell Valley, Lye Valley Nature Reserve, Raleigh Park and Rivermead Nature Park. Judy gave a talk to the Oxford Ornithological Society on Oxford’s Floodplain Meadow Flowers. About 80 people attended. For photos, click here. ​For notes on the talk, click here. As a guide to planting hedges, Judy recommends Rob Wolton's leaflet, 'How to manage hedges to maximise their benefits for people and farms' (7 April 2014), which was originally posted on the Hedgelink website ('hot' links on their home page don't work at present). 25 November 2016 Judy gave a talk on New Wildlife Discoveries in and around Aston Rowant and Watlington to the Watlington Environment Group. 6 November 2016 At a conference on 'Plant Conservation in the Anthropocene', organised by the Oxford Flora Group of ANHSO, Judy gave a presentation on successful and unsuccessful examples of the introduction and translocation of rare plants. The slides she showed are available (Powerpoint) here. 6 September: talk, in Abingdon, on the work that members of Abingdon Green Gym have done on the fen at Cothill NNR and nearby Frilford Heath Golf course and what needs to be done in the future. 2 August 2016 Judy led a training workshop on how to identify common wetland plants, which was organised by PondNet (Freshwater Habitats Trust) as part of the Heritage Lottery Funded People, Ponds & Water project. A morning classroom session in Headington was followed by a field visit to Milham Ford Nature Park. For photos, click here (first 3 photos by Heather Armitage, the rest by Marilyn Cox). 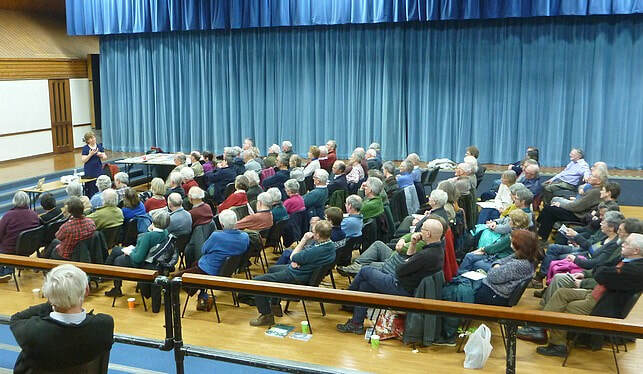 1 June 2016: a talk on the Lye Valley and Hogley Bog given at the invitation of the Cheney Over-50s Club in Cheney School Community Hall, Headington. The large number of slides Judy used to illustrate her talk included photos of the diverse vegetation that provides a habitat for insects, amphibians and reptiles and the 22 rare wildflowers that are dependent on the special water chemistry of the fen, including the Grass of Parnassus, Parnassia palustris. Judy explained how these rare and beautiful species, documented by botanists since the 17th century, are under threat from development. Loss of green areas to buildings and roads affects the flow of the alkaline, calcium-rich, water to the fen, on which the species depend, by starving the springs that provide it - see Summary of threats. 22 July 2015: Abingdon Naturalists Society: Fen Ecology, an illustrated talk given by Judy on the wildlife (large and small) of the Oxfordshire alkaline fens, perhaps the most ancient and rare habitat type in the country. A presentation given by Judy to the Oxfordshire Recorders and Conservation Day, 1 March 2014, Oxford University Museum of Natural History. Judy was in the Chilswell Valley sowing seed of Devil's-bit scabious, greater bird's foot trefoil, meadowsweet and parsley water dropwort that had been collected in the Lye Valley. Judy carried out her first survey of the year in Chilswell Valley for the BBOWT Wild Oxford Project. There are increasing numbers of cowslips, goldilocks buttercups, bluebells, violets and wood anemones thanks to scrub clearance and coppicing carried out over the winter largely by volunteers. For photos taken that day, click here. 17 June 2017: Judy led a walk in Dry Sandford Pit - photo taken by Sally Gillard of Abingdon Green Gym. There is an article by Judy comparing the flora of Dry Sandford Pit with that of Cothill Fens in the May 2017 edition of the Newsletter of Friends of Cothill Reserves. 12 March 2017: Rod d'Ayala and Judy spread wildflower seed at Rock Edge Nature Reserve, Headington. The seed had been collected from Milham Ford Nature Park, except for Greater Knapweed and Field Scabious; that seed came from flowers at Rock Edge. For photos, click here. To make hidden captions/information, visible, click on the white circle with the 'i' in it at top right when viewing photo full size. 16 July 2016: wildflower identification walk around Milham Ford Nature Park - for photos, click here. The walk was followed by collection of wildflower seed to be sown in other wildlife areas in Oxford, including Rock Edge Nature Reserve. 17 July 2016: a walk around Rock Edge to see which wildflowers are good for bees and other pollinators. Sowing of Yellow Rattle seed collected the previous day from Milham Ford Nature Park. ​6 July 2016: Guided walk in the Lye Valley. See Oxford Mail article, 7 July 2016. ​ Heather Armitage took some photos. 2 July 2016 National Meadows Day: a walk through the Oxford Meadows SAC. For photos taken by Judy Webb and Christopher Hoskin, click here. See also Oxford Meadows SAC page. 8 May 2016: Judy led a guided walk during the BBOWT picnic event in Chilswell Valley (which is owned by Oxford City Council and also known as 'Happy Valley). 26 Sept 2015: Judy was at the Fen in her role as a volunteer for Natural England overseeing and directing work, although the Green Gym leader on this occasion was James White. ​For photos of the reed clearing and also one taken by Judy of a mating pair of Common Darter dragonflies (Sympetrum striolatum) click here. 6 Aug 2015: Judy and Andy Gunn, BBOWT's Community Wildlife Officer for Oxford, led a walk in the Chilswell Valley for new members of BBOWT. For Judy's report on the Chilswell Valley, prepared as part of BBOWT's Wild Oxford project, click here. Judy spent Sunday, 15 June 2015, with the Oxfordshire Flora Group at Hackpen Hill chalk grassland near Wantage, where large numbers of 5-spot burnet moths were seen flying. This photo, taken by Judy, shows one of them queuing to extract nectar from a Rough Hawkbit flower. Bee Walk on Sunday, 12 July 2015, promoted by Oxford FoE, led by Judy, who helped with identifying bees and other pollinators. ​16 July 2014: Judy visited to advise Ruth Ashcroft, Secretary of Friends of Aston's Eyot on how to improve the variety of species useful to wildlife. ​Photos taken during her visit See also Oxford Times article 7 August 2014. 6 Dec 2014: Judy joined members of Abingdon Green Gym in maintenance work in this National Nature Reserve. Volunteers included young people doing the work in relation to a Duke of Edinburgh award. Photos taken by Judy, click here. 6 Dec 2014: Judy spent some time working with volunteers on the Wild Oxford project clearing the overgrown fen in Rivermead Nature Park. During the work a rare white-bracket fungus, Trametes suaveolens, was found sprouting from an old willow log. For photos, which include the fungus, click here. This BBOWT-grant-funded project in collaboration with Oxford City Council aims to improve biodiversity in three wetland sites in Oxford owned or managed by the Council. Judy is the Ecological Adviser for this project. She is contracted to monitor its success and report annually to BBOWT. The Coordinator is Andy Gunn. The work involves removal of large willow trees and scrub, which have colonised the tufa-forming alkaline fen on a depth of peat, also cutting and raking off the reed and rush to stimulate a variety of smaller flowers that were being suppressed by deep shade. Volunteers from the New Marston Wildlife Group collected wildflower seeds from Milham Ford Nature Park for sowing at Rock Edge LNR. Judy delivered leaflets to residents near the Reserve asking for volunteers to help spread them. 14 people turned up at Rock Edge on 3 August 2013 to sow the seed. See report, with update for 2014.